33 organizations will benefit from anti-racism grants from the Alberta Government. This is a first for the province, which will distribute the grants to create greater awareness and cross-cultural understanding to reduce racism. These grants were a key recommendation from the government’s Taking Action Against Racism report. “One of Alberta’s strengths is its diversity. Racism has no place in our province. That is why our government is making life better for all Albertans by supporting projects that are working to combat racism and promote inclusiveness. With these grants, non-profit groups will be able to educate, inform and engage community members across Alberta,” said culture and tourism minister, Ricardo Miranda. More than $600,000 will be provided through two funding streams. The Community Anti-Racism stream, which supports projects or initiatives with a broad community focus and the Indigenous Anti-Racism stream for initiatives involving First Nations, Métis and Inuit peoples. “We have been working for over 20 years with Indigenous people to address discrimination. With the Rights Path in Action project funded, we will be able to continue our advocacy through a community action team. We are extremely excited to get started on our project,” said Institute for the Advancement of Aboriginal Women vice-president, Marggo Pariseau. Recipients include Soccer Without Boundaries and the Institute for the Advancement of Aboriginal Women. Organizations that meet eligibility can apply for matching grants up to $25,000 for a variety of projects that include training and education, development of informational resources and support services and capacity building. The application for the next round closes on March 1. The provincial government committed $2M to the Anti-Racism Community Grant program in 2018/19. 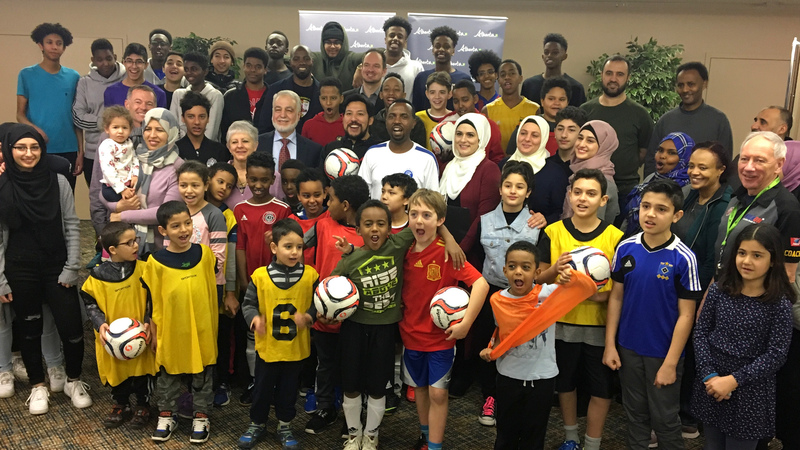 Photo supplied: Youth participants and parents with Soccer Without Boundaries — one of the first organizations in Alberta to receive funding from the Anti-racism Community grants.